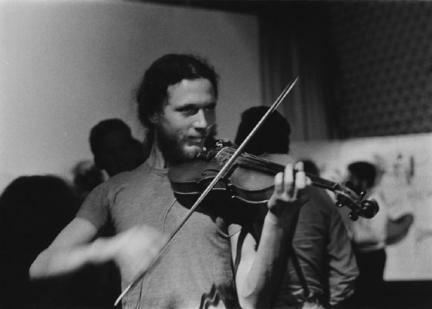 Born in New York City, Dimitri studied violin since he was 12. He played with youth orchestras in Carnegie Hall and Lincoln Center. He studied modern composition with Joan Tower, widely regarded as "one of the most important American composers living today." His violin teacher was Lucille Anne Gewinner and his favorite composers are Bach, Mozart, Bartok, Corelli, Vivaldi, Hayden and GF Handel. At the age of 17, Dimitri spent a summer playing electric violin with the legendary jazz master Rahsaan Roland Kirk and his combo at the Both/And Café in San Francisco. Kirk "was renowned for his onstage vitality, during which virtuoso improvisation was accompanied by comic banter, political ranting, and the ability to play several instruments simultaneously." Dimitri loves jazz - especially John Coltrane and ”Bird” – Charlie Parker, Calypso, Reggae, Old English Spirituals and the Blues – Howlin’ Wolf is Dimitri's beloved Blues man. As critic Cub Koda described him, "no one could match Howlin' Wolf for the singular ability to rock the house down to the foundation while simultaneously scaring its patrons out of its wits."